The present project, ambitious as well as realistic, is a joint initiative of the Complutense and the Polytechnic Universities, together with other institutions located in the Campus, such as the CIEMAT, the CSIC and the INIA. Its aim is to transform the Campus Moncloa into an international reference in research, education and innovation in a sustainable way. The Moncloa Campus defines itself as sustainable, healthy and socially responsible. Our proposal targets specifically the Moncloa Campus and the various institutions located in it, although it is also directed to other neighbouring institutions or which have close links with the promoting Universities. The Ciudad Universitaria of Madrid, the Moncloa Campus, was conceived in 1927 on a 460 ha estate in the Northwest area of the city of Madrid as an integrated campus, where education, science and culture would harmoniously merge with each other. Nowadays, it is fully integrated in the Metropolitan area of the capital city. In 1999, the Regional Government declared it a site of public cultural interest owing to the value of its landscape and its architectural and natural heritage. It was assigned a high level of protection and strict limitations regulated the excessive growth of the building volume. The Campus houses the two promoting universities, as well as the centres of research institutions such as the CSIC, The CIEMAT and the INIA, among others. This makes the Campus of Moncloa, with its more than 10.000 researchers and its 10% of the national scientific production, a unique environment to foster synergies directed to higher education, research, innovation and social and cultural projection. Eighty-two years after its foundation, the project of the Moncloa Campus endeavours to take the lead again and meet the challenges of the 21st century by combining the perspective of the triangle of knowledge and social responsibility. 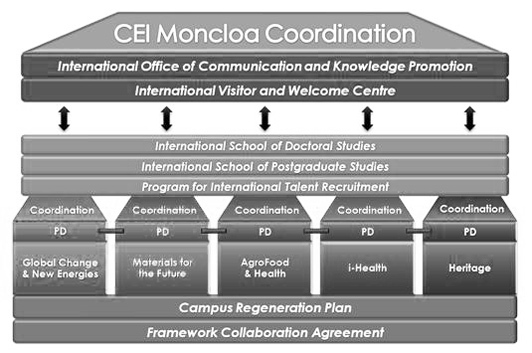 The Moncloa Campus is a new project, with its own identity marks (logo, seat, URL), based on a general agreement of cooperation between the two coordinating universities and resulting from a Strategic Plan designed with the active participation, the implication and the complicity of the various partners involved. The general agreement stems from the idea of sharing a common campus, as well as physical and human resources for teaching and research, and above all, partaking in a common vision about the role that the Campus Moncloa should play in the international scene, with a coinciding aspiration: excellence university. The Moncloa Campus claims to define a space of connectivity among all its partner institutions which will simultaneously exploit the resources deriving from their complementarity and benefit from the individual strength of each of them in order to transform diversity into energy and, with a joint effort, to progress towards the future. a) The Axis of Research (Creating): to achieve research excellence. 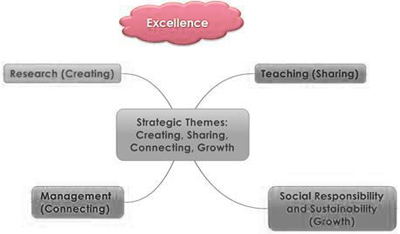 b) The Axis of Teaching (Sharing): to integrate and coordinate teaching. c) The Axis of Management (Connecting): to offer optimal services. d) The Axis of Social Responsibility and Sustainability (Growing): to promote the institutional and individual commitment to social and environmental sustainability. 1) SO1- Knowledge: to be a reference centre in knowledge and technology, particularly in the areas of the clusters. 2) SO2- Transfer: to make a qualitative leap forward in the collaboration between university-society-business. 3) SO3- Education: to generate an identity that will be recognized in Europe as a guarantee of professional excellence. 4) SO4- Services:: to improve the management and the services offered to students, teaching and administrative staff and visitors. 5) SO5 - Social Responsibility and Sustainability: To carry out social, environmental and health-related improvements on the campus. 7) TO1 - Internationalisation: to increase the internationalisation of the campus in all areas. 8) TO2 - Connectivity:to ensure permanent connections between individuals, research groups in their respective areas, the institutions and their environment, as a tool and driving force for the campus. 9) TO3 - Equity: to promote Gender and Social Equity on campus, eliminating physical barriers and paying special attention to those with disabilities or special educational needs. • The project Campus, directed to the regeneration of the common grounds of the Campus from the perspective of urban planning, environment and mobility. • The project Headquarters, aimed to restore and adapt the main building of the Head Office to the various needs of the Campus government, administration and services. • The adaptation of teaching facilities to the requirements of EHEA. • The projects of University Residences and the Campus International Centre. • The Healthy Campus, Gender Equality and Accessibility plans. • The International Office for Communication and Knowledge Promotion and the International Visitors and Reception Centre. a) Global Change and New Energies: it integrates the various groups of the Campus working on environment and new energies. The partnership of the CIEMAT, the top Spanish scientific institution in energy and environmental studies, with its outstanding facilities (Nuclear Fusion Reactor TJ-II, Technofusion) is a fundamental added value to the cluster. b) Materials for the Future: it integrates those research groups of highest standard dealing with structural and advanced functional materials, as well as biomaterials, together with two specialized scientific and technical units (ISOM and CMA). c) Agri-Food and Health: it includes around Moncloa´s Agri-food Corridor the activities of the groups working in the specialized areas of agricultural and livestock production, and the processing of safe, healthy and high-quality food products for human and animal consumption. d) i-Health: it exploits the presence and coincidence in the Campus of the Centres of Biomedicine, the University Hospitals and the experts in Information and Communication Technologies oriented towards the applications in Health to improve quality of life. e) Cultural Heritage: it takes advantage of the existence in the Campus of the School of Arquitecture, and the Faculties of History and Geography, and Fine Arts, as well as of the research groups and laboratories for the study of Science and Technology of Heritage. This will allow for an interdisciplinary and global approach to the study of everything related to the discovery, restoration, preservation and appraise of the Campus cultural heritage. Each cluster presents a series of thematic initiatives in the different action fields established in the Call for proposals. Among them, the following are of significant relevance: the creation of maps and infra-structures networks for the exploitation and the various services of the Campus; the construction of a Multipurpose Bio-climatic Building (EBM) for research groups and infrastructures associated to the cluster of Global Change and New Energies and the installation of spin-off bio- incubators.